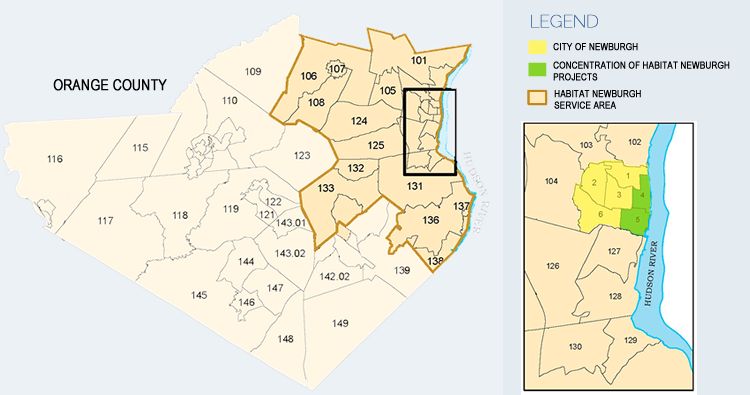 Habitat Newburgh’s service area comprises 25 census tracts in Orange County, New York. This service area includes: the City of Newburgh, the Town of Newburgh, Town of New Windsor, Village of Goshen, Monroe, Washingtonville, Village of Walden, Cornwall, Cornwall-On-the-Hudson, Montgomery, Gardnertown, and Vails Gate. Habitat Newburgh concentrates its work in the City of Newburgh, which is the most distressed urban area in New York State, and in neighborhoods of greatest need – Census Tracts 4 &5. These two tracts contain the largest contiguous historic district in New York State (known as the East End), have the highest rates of poverty, crime and violence, and deteriorating housing stock. In this area alone, there are approximately 770 vacant/condemned buildings.